Goth has been around since the 1700s, so I guess it's about time I jumped on the bandwagon, eh? I am talking about the genre, not the subculture that started in the 1980s (ah, the years of my youth...). It isn't that I didn't have an appreciation for gothic literature before now, I just didn't read it in regular rotation with other genres. Most of my experience with gothic literature has been the classics: Mary Shelley, Edgar Allen Poe, Henry James, Charles Baudelaire, and Washington Irving. I didn't really delve into modern goth until a few years ago when I became entranced by Dean Koontz's Frankenstein books. I highly recommend them, I enjoyed them immensely, but I know those types of books aren't for everyone. I wouldn't have thought they were for me, but I couldn't get enough of the series. I was not a Dean Koontz fan until I read those and, truth be told, I haven't read any others by him since. Too many other authors to read and experience, and there's just too little time, you know. 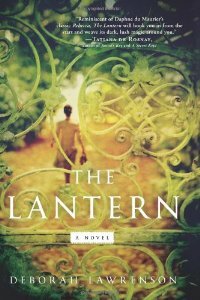 Reading Koontz's series, though, gave me a renewed taste for gothic literature, and I began to seek out more novels in this genre,...which leads me to talk about the book The Lantern by Deborah Lawrenson. Doesn't look like a ghost story, eh? I was first drawn to this book because of the cover, which showed an old house in a huge field of lavender. There is a place in France I long to visit and see those fields of lavender, so when I found this to be the very setting of the novel, I was interested enough to preview the book a little more. I also have to admit that I can be a sucker for books with a deckle edge (uneven pages at the edge). What I see and touch affects my attraction to things and my desire to possess them. This explains why I love real books more than ebooks. Ebooks are for convenience and instant gratification, while real books are treasures. 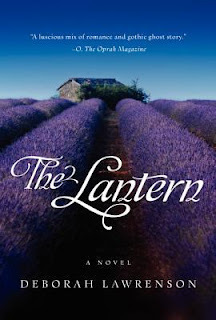 The Lantern is about a woman who meets a man, falls in love hard and fast, and gets married. Simple enough, right? Not quite. Once they buy a house in France, and the honeymoon period is over, she begins to wonder if the man she married isn't all he appears to be. She begins to suspect there's something sinister lurking beneath this gentleman's charm and odd things begin to happen. This novel also has more than one story going on. While the married couple is in the present with their problems, there is another story (with more problems) from the past that occurred in that same house in France. Both stories are intriguing and both are mysteries that are slowly unraveling. The author does a good job of telling both stories and making connections between what is going on in the present and what happened in the past. OK, enough about bad title choices. I enjoyed the book, and it gets a good bit of respect from me because I couldn't figure out the end by the time I was halfway through it. I liked the characters, it kept me interested, ...and I did hear a few things go bump in the night while I was reading it. I thought I should show you the other book cover for the novel. I didn't know this one existed until after I'd read the book. As book covers go, this one would not have attracted me and, with the lame title, I might have passed it by. I'm so glad I didn't.